Best wishes to all my readers for the holidays and the new year. My blog will restart early January. For those interested in employment equity and diversity reporting, this first report provides a model for future reporting on judicial and other GiC appointments. 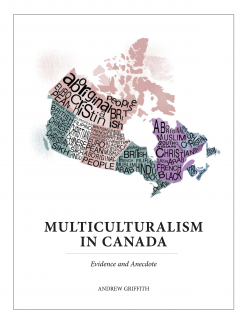 While I have some quibbles – the reference number for visible minorities should be the percentage of those who are also Canadian citizens (15 percent), not the age adjusted workforce population as they have appeared to use (17.8 percent), a breakdown of the ethnic/cultural groups self-identified would be helpful, along with some methodology notes – this is really a good and comprehensive report. Of course, this report does not include other aspects of diversity such as education, work and the like. 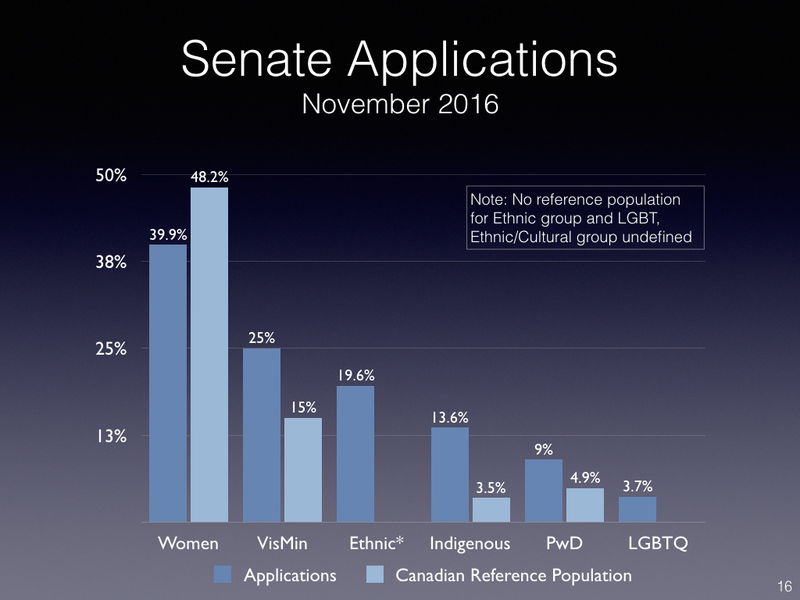 By way of comparison, the 28 Senate appointments of PM Trudeau were comprised of 16 women (57 percent, higher than the 40 percent of applications), six visible minorities (21 percent, slightly lower than the 25 percent who applied) and two Indigenous persons (7 percent, twice that percentage of those that applied). The independent board that advised Prime Minister Justin Trudeau on a recent round of Senate appointments says 2,757 people applied to be senators when the Liberal government went looking to fill vacancies for seven provinces. Canadians were invited to apply when nominations were opened in July to fill 21 spots in the upper chamber. The independent advisory board that reviewed the applications is part of Trudeau’s plan to reform the Senate. According to the advisory board’s first report, 60 per cent of applicants were male and 68 per cent selected English as their first language. Twenty-five per cent identified as a visible minority, 13.6 per cent described themselves as indigenous and four per cent as LGBT. “We were very pleased with the number of applications received, as well as with the calibre of individuals who put their names forward as part of the open application process,” the board writes. The board says that “nearly 750 national, provincial and local organizations” were also contacted to encourage applications. Applicants were screened by board members to identify “a list of priority candidates who … best met the merit-based criteria.” The prime minister was then provided with a list of five candidates for each of 20 vacancies, with additional names passed along to fill an unexpected opening for Manitoba. The board also clarifies that the prime minister’s choices for appointment came from their recommendations. “We were very pleased that the prime minister made his recommendations to the Governor General from the list of candidates that we had provided to him,” they write. The total cost for the advisory process so far is estimated to be approximately $900,000. Maryam Monsef, minister of democratic institutions, also announced on Wednesday that the federal government has opened applications to fill another six vacancies: three in Nova Scotia, two in Ontario and one in New Brunswick. Two tribunals have begun making home access to high-speed internet a prerequisite for dozens of well-paid federal government appointments, despite the fact it could disqualify many Canadians living in rural and remote areas of the country where high-speed internet isn’t available. The Social Security Tribunal and the Veterans Review and Appeal Board have both recently added high-speed internet access to the list of criteria for those seeking the lucrative appointments, which come with salaries ranging from $108,200 to $127,200 for full-time positions, and between $540 and $635 a day for part-time positions. “You must work from your home office in Canada and have access to high-speed internet,” say the conditions of employment for the Social Security Tribunal, which resolves disputes involving employment insurance, the Canada Pension Plan and Old Age Security. The requirement appears to have been added in recent months. A similar notice of openings for the tribunal in June 2015 said candidates might have to work from home but did not require high-speed internet access. The Social Security Tribunal has dozens of full-time and part-time members, including several vacancies at the moment. On Wednesday, the CRTC ruled that access to high-speed internet should be a basic service across Canada. It said two million Canadian households lack access to proper internet service. The Veterans Review and Appeal Board, which resolves disputes over disability benefits decisions made by Veterans Affairs Canada, also has this requirement. Spokeswoman Alexandra Shaw said successful candidates for the board are expected to work in one of six urban centres across Canada and to work from home because the board’s only administrative offices are in Charlottetown, Prince Edward Island. As I reflect upon Nasiba, who contributed generously to the Canadian landscape, so many wonderful teachers from our rich, diverse Canadian mosaic come to mind. I was inspired to study physics by my high school teacher, Mr. Szatmari; and quantum mechanics at Marianopolis CEGEP by Dr. Aniko Lysy. Both were Hungarian, passionate about science, and most importantly, believed in me, when I lacked confidence in my own abilities. At McGill, Prof. B.C. Eu, originally from South Korea, was instrumental in paving a path toward my study of chemical physics, and entry into Harvard. There were many more along the way. Influential coaches, teachers, counsellors and friends – from a variety of backgrounds and perspectives who helped me to thrive. Suffice it to say that as calls for nativism increase, let us reflect upon the rich contributions made by immigrants and their descendants to our mosaic. The struggle to adapt to a new land, a new culture is circuitous at best. Yet millions do it, day in, day out, without recognition – only wanting to belong, to contribute, to succeed, and to forge new paths, new identities. It is both daunting, yet exhilarating. It cannot be accomplished in isolation, but rather, by reaching across cultural lines, and seeing the commonality and beauty of the human spirit – for example, by inspiring a student to learn and giving her the confidence to pursue her dreams. In the process, we strengthen the fabric of our compassionate meritocracy. This morning, at dawn prayer, I broke down and wept, realizing that I would no longer have those beautiful tutorials with Nasiba again. Never hear her gentle, encouraging voice. The finality of death is indeed harsh. All the more reason to make the most of our time here, to cultivate the best within each of us, and to share the fruits of our labour. Maybe it’s all the recent data about the sad state of equitable pay and glass ceilings. Or the millions of women leaning in without a sea change in senior-level representation. Or the waves of thinly disguised to blatant sexism that surfaced during the recent presidential election. Or the fact many of us are women ourselves. More likely, it’s a combination of many things that contribute to the workplace diversity zeitgeist being focused primarily on achieving gender parity. When diversity programs focus on “women” as a whole, they often fall into the trap of prioritizing the majority: White women. We expanded initiatives to address three crucial areas alongside gender: Race, age and geography. Take me, for instance. I’m not only female but also Latina and queer, both of which color my experience and the obstacles I’ve faced in the workplace. To make progress for all women, we need to acknowledge that women are also black, senior, immigrants, LGBT and so forth — and often many other things at once. Each of these identities faces unique biases and challenges that must be accounted for if we want to get closer to true gender parity. After all, a company dominated by men hiring women from similar racial and socioeconomic backgrounds is not diversity in a meaningful sense, it’s one small step away from homogeneity. Fighting for all women is even more important now, with outright discriminationincreasing rapidly after the election. Mind you, fighting for all women is not as easy as it may sound. Even Pinterest, which is one of the leading companies on diversity issues, recently updated its goals for what it could feasibly accomplish in a single year. However, it’s even more important for us to do so now with outright discrimination increasing rapidly after the election. In designing company wide programs at Atlassian, I focus on expanding initiatives to address three crucial areas alongside gender: Race, age and geography. When I joined Atlassian as the company’s first Global Head of Diversity & Inclusion, it was clear to me that leadership understood the importance of diversity and was invested in creating and maintaining it. But the biggest question was how and where to start. Race quickly jumped to the top of the list for a simple reason: People of color — and specifically women of color — often have more difficulty entering and staying in the technology industry than their white counterparts. We created a high-touch scholarship program specifically for black, Latina and Indigenous women. To address this first piece of the puzzle, we partnered with Galvanize to create a high-touch scholarship program specifically for black, Latina and Indigenous women. Because tech workers are significantly more likely to be white or Asian, women of color are less likely to have close friends or family who have worked in technology, smaller professional networks and more difficulty accessing their first jobs. Our program is designed to address each of these specific challenges: Each recipient is paired with a current Atlassian employee who acts as their mentor and personal cheerleader (to get through those moments of doubt) and are invited to our company events to grow their network. They also work with a member of our recruiting team for feedback on their resume and to explore internship opportunities at Atlassian. Our first recipient is already working with our HipChat team in Austin, Texas. Ageism is the elephant in the room in many industries. Older workers are often seen as out of touch or less capable, despite often being highly qualified for the roles they apply for. Some 64 percent of older workers have experienced ageism in the workplace. In industries like technology, the average age of a worker is often well below 30, fostering an environment where anything but “young and hungry” (read: able to stay at the office until 10 pm) is seen as abnormal and a disruption to workplace culture. Age discrimination is notoriously worse for women too, thanks to a culture where a woman’s worth is intrinsically tied to her physical appearance. We include age in our annual diversity report as a way of holding ourselves publicly accountable. One of the first steps to combat ageism is to actually track the age of your workforce, something many companies have been hesitant to do. At Atlassian, we included age in our annual diversity report as a way of holding ourselves publicly accountable. It’s also critical to consider how to market company culture and the work environment (and how you live up to that branding). For Atlassian, this means ensuring that our Careers page doesn’t solely focus on perks like ping-pong and beer on tap. Instead, we promote benefits like comprehensive health coverage, flexible work policies and even backup childcare offerings. This helps us attract candidates at multiple stages of life and sets them up to be successful once they join us. Diversity programs are often built from a local viewpoint, but what diversity means may vary drastically based on where you are in the nation or world. For example, while the conversation in the United States is often centered around gender and race, those concepts don’t always resonate in the same way beyond U.S. borders. In Atlassian’s Sydney headquarters, women’s cultural backgrounds and Indigenous identities are more salient. In Manila, womens’ religious identities are a key driver of the diversity discussion. In Europe, issues of national origin and immigrant status are more resonant. As businesses become more global, diversity programs must be globally cohesive but locally relevant, and take into account the unique makeup of talent in each location. As businesses become more global, diversity programs must be globally cohesive but locally relevant, and take into account the unique makeup of talent in each location and how (and with whom) people conduct their work. For example, while developing Atlassian’s unconscious bias training, I quickly realized that some nuances wouldn’t translate for certain offices. Talk to people who live in the Philippines about unconscious biases against black people created by a history of oppression and slavery, and you’ll have a hard time helping them understand how these biases can affect their teams, for example. I quickly changed our approach, moving to develop versions specific to each region in which we operate to make the content relevant and actionable for every Atlassian. While we teach the same core concepts in each location, we now vary the terminology (tailored to local English), the research we cite (biasing toward research conducted locally), and even the level of activity versus lecture for participants (based on local feedback and customs). Because there are different types of unconscious biases often held against women from different backgrounds, customizing our training materials by geography meant that we could address those biases more effectively and benefit all women across the organization. Diversity is one of the most important issues in modern business, and it’s more important that we fight harder for it than ever. Working to increase the representation of a group that makes up 51 percent of the world population seems like the logical first step to maximize impact. But to get closer to achieving true gender equality, we need to start by taking into account the multiple components that make up women’s identities. Only then will we be able to build better, more inclusive programs that benefit everyone and accomplish our goal of building companies made up of truly diverse teams. All political leaders, even dictators, must take some note of how their people feel, and the citizens of poor and middle-income countries are often no better disposed to immigrants than are voters in the rich world. Besides, a government that threatens to shut its refugee camps or uproot millions of migrant workers from their homes might be able to extort some money out of Western donors. But the treatment meted out to immigrants in developing countries is nonetheless dismal—futile, illiberal and economically ruinous. Even in rich countries, where most workers have formal jobs and are known to the authorities, illegal immigrants are hard to catch. In poorer countries, where the state is weak and almost everybody works informally, it is close to impossible. National boundaries tend to be porous. At about 4,100km (2,500 miles), the border between Bangladesh and India is longer than the border between Mexico and the United States. It is so thinly policed that cattle can be trafficked across it. Like migrants everywhere, the people who cross into developing countries are nearly always trying to better themselves and their families. Unlike the migrants who make it to the West and the Gulf states, they are frequently very poor indeed. When America and Europe tighten their borders, middle-class Indians and Nigerians lose out; when India and Nigeria crack down, some of the world’s most desperate people suffer. The astounding success of the south Asians who were booted out of Kenya and Uganda in the 1970s and ended up in Britain suggests that Africa would have done well to keep them. Migrants bring dynamism and fresh ideas to poor and middle-income countries as well as rich ones; the lump-of-labour fallacy is just as fallacious in the developing world. Sometimes governments realise this and pull back. In 2014 South Sudan unveiled a mad plan to force companies to sack their foreign workers within a month. It backtracked when firms and charities pointed out that they could not function without Kenyans and other immigrants. South Sudan is not exactly overflowing with skilled graduates who can keep the lights on. It would be far better for the immigrants and for the countries where they fetch up if governments widened the legal routes for settlement. At present some of the world’s least appealing places have the toughest visa requirements and expect economic migrants to jump through the tiniest hoops. You would think their streets were paved with gold. Did Silicon Valley, which has reaped the rewards of this system by amassing startlingly enormous piles of wealth, imagine that all this would not eventually have to be paid for by someone? But in this, Thiel is correct: The results of tech have been and will continue to be devastating to too many in the general populace. So it would be nice if Silicon Valley could take that sentiment to heart as the days and years that stretch ahead look ever more serious and more fraught by all the technologies that have been created over the last two decades. What happens to all the many jobs that will be impacted by self-driving technologies, given so much of our population makes its living driving and transporting? While it may be for the best in terms of energy savings and the ending of needless human-caused accidents, is anyone developing in this arena thinking about its repercussions on existing jobs or scoping out what new jobs can be created? It’s the same thing with a slate of on-demand or home-rental tech, the impact of which are too often shrugged off as “negative externalities,” which is a great euphemism for terrible things. Something can be both promising and also devastating at the same time, so try hard to take both things in. I am not heartened that anyone in the high echelons of tech is thinking about any of this in a consistent and systematic way, largely from the reaction so far. Calls for California to secede from the U.S. — fyi, we’ll need a lot more firepower than what comes from servers to do that — come only because figuring out what’s next is really hard. Murmurs that Silicon Valley companies might place a token manufacturing facility in the U.S. to shut Trump up seems not really profound enough to make a true difference. Memos and quotes saying techies will not create appalling things like Muslim registries are great, but do not address what they will do in cooperation with an administration bent on destroying many, many more core values of this industry. It all reminds me of the vision that tech continues to reflect about itself as a place of fresh ideas and newness at all times. To my mind, which I often say — hat tip to investor Pejman Nozad — Silicon Valley is still a place of big minds chasing small ideas. It’s often referred to as a Peter Pan mentality, in which its denizens are trying to remain forever young in a land of perpetual boyhood, making things like photo apps and social media and new ways to play old video games. Personally, I think there is a far more sinister comparison to another fairy tale, that of Pinocchio’s transformation into a jackass on Pleasure Island. It’s a place where boys are indulged with endless fun until it becomes clear that there is actually a price for all that indulgence. Well, Silicon Valley, it’s finally time to pay up and admit that you are not forever young. More importantly, you need to stop acting like you aren’t powerful or that you don’t have huge businesses and, most of all, that you just can’t fix big problems because it’s super-duper hard. You’ve been part of creating this mess and you should absolutely be part of fixing it. One of Bouzar’s methods for treating young people seduced by ISIS involves re-establishing links between radicalized individuals and their former lives. She counsels parents to try to bring them back in touch with their childhood — through old pictures and videos or food. Celine tried this with her son and had little success at first, but she persevered. “I made all his favorite meals that he loved as a child,” she says. “And I took him to places he liked when he was young. I did everything to reconnect him with his childhood.” Eventually, she noticed he was becoming more open to discussion. He took an interest in school again. The empty look vanished from his eyes. Bouzar says a person can only be brought back with the help of someone close, like a parent or other family member — or by a reformed jihadist himself. Bouzar says there is no such thing as a radicalized youth who wants to be de-radicalized. “He thinks he’s been picked by God and he sees things no one else does, because [everybody else is] indoctrinated,” she says. Bouzar’s methods have been controversial. Some say her use of allegedly reformed jihadists is dangerous. (In some cases, it can be challenging to ascertain whether they’ve really reformed or are pretending.) Others accuse her of self-promotion. Many more say treating radicalization as purely brainwashing is to underestimate geopolitical and social factors, and the role that radical Islam plays. Benjamin Erbibou, who works with an organization called Entr’Autres(Among Others), a group that works with radicalization issues in the southern city of Nice, thinks only a small percentage of radicalization cases are linked to brainwashing. But Marik Fetouh, deputy mayor of Bordeaux and head of the city’s de-radicalization center, says it’s easy to criticize efforts to deal with radicalization because it’s a poorly understood new phenomenon. “Bouzar came forward with real ideas to fight this complex phenomenon when pretty much no one else had a clue what to do,” he says. Although her contract with the French government is over, Bouzar’s association still counsels families affected by radicalization. Bouzar and her teams have counseled more than 1,000 young people and their parents — from Muslim, Catholic and atheist backgrounds.